By Dan Ambrose: Brandon ‘Bam Bam’ Rios (34-4-1, 25 KOs) will reportedly be facing Saul Canelo Alvarez’s 32-year-old brother Ramon ‘Inocente’ Alvarez (27-6-3, 16 KOs) at a catchweight of 151 pounds on November 17 on Matchroom/DAZN, according to BarbozaBox at ESPN Zona. This will be a fun little fight between a couple of slow, plodding punchers. Rios has the better power, skills, experience and inside fighting ability. Alvarez is a little faster, and throws better combinations, but he’s going to be badly over-matched against a fighter like Rios. It’s unclear if Rios has signed with Eddie Hearn’s Matchroom Boxing USA/DAZN stable. Given Hearn’s signing of the likes of other past their prime fighters in Jessie Vargas and Julio Cesar Chavez Jr., it wouldn’t be surprising if he’s added Rios to his stable as well. You would have to think that Hearn would sign someone like Rios to a short deal, because it would be too risky in signing him to a multi-year deal with the way he’s been performing in his last three fights. This is a battle between two struggling fighters, who have seen better days. Rios, 32, is clearly the much better fighter of the two, and always has been. Rios has been a world class fighter during his 14-year pro career. Alvarez has always been a second tier fighter, and he hasn’t been able to make the jump to world class for whatever reason. Alvarez lacks the speed, power and boxing skills of his younger brother Canelo Alvarez. Rios is coming off of a 9th round knockout at the hands of Danny Garcia last February. Despite losing the fight, Rios gave Garcia a lot of problems with his pressure and heavy hands. Garcia was badly marked up around the face during the fight. Rios has lost two out of his last three fights, and looked bad. 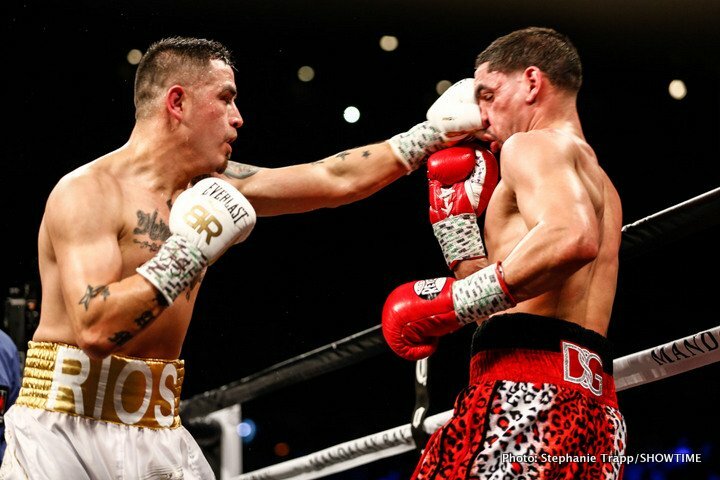 Rios still possesses the punching power that he’s alway had, but his speed has taken a hit due to age and ring wear. His other loss in his last three fights was a 9th round knockout at the hands of Tim Bradley in 2015. Rios weighed in at 147 pounds for that fight, but then he rehydrated 23 pounds overnight and came into the ring weighing 170 pounds. Rios looked slow and sluggish, and not in the kind of shape that he needed to be for him to be taking on a fighter in Bradley’s class. Bradley took advantage of Rios’ lack of of conditioning by battering him with shots for eight rounds until stopping him with a body shot in the 9th. Alvarez has losses to Omar Chavez, Antonio Margarito, Daniel Sandoval, Jesus Aceves, Agustin Marquez and Mario Alberto Lozano. Alvarez’s management haven’t put him in with any relevant fighters during his career. Margarito was over-the-hill at the time Alvarez fought him in 2016, and he still lost to him by a 10 round split decision. Alvarez has won his last three fights in beating journeyman Johnny Navarrete, Jorge Paez Jr. and Nicolas Luques Palacios. A loss for Rios against Alvarez will be a clear sign that he needs to retire from boxing. Rios can’t afford to lose to a fighter in the class of Alvarez. Heck, even if Rios wins, he still needs to consider retiring, because he’s not going anywhere. If Hearn is willing to pay Rios good money to fight on his Matchroom Boxing USA/DAZN cards, then more power to him. I don’t think Hearn is going to be able to get much out of what’s left of Rios’ game at this point in his career. Some of the casual boxing fans that are familiar with Rios’ name and not aware that he’s past his prime might be tempted to subscribe to Hearn’s DAZN platform to see him fight, but it’s doubtful that many fans will be willing to do that.